Selenium is absolutely essential for proper thyroid function. One of its functions is to help the body convert the inactive form of thyroid hormone to the active form. Selenium may also have a protective effect against Hashimoto's Thyroiditis. We recommend using selenium if you are taking Prolamine Iodine; however it is no longer needed if you are taking Thyodine. We recommend a total daily intake of 200-400 mcg./day, depending on body size. Click on the following link to read an informative article on Interactions Between Selenium and Iodine. * (180 200 mcg. 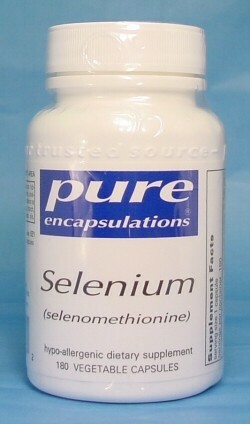 capsules of selenomethionine. Will last 6 months.) Selenium is also an excellent anti-oxidant and research indicates that it may help to protect against degenerative diseases such as cancer.